Get the complete, systematized, step-by-step StrongPosture® Rehab Program used by thousands of your colleagues worldwide. Building engagement is a big key in connecting with patients, getting referrals, and building a thriving practice. • Implement step-by-step rehab protocol into your practice. Includes everything to begin implementing Strong Posture Rehab Exercise Protocols. Manual gives detail, order to teach, how to cue patient/client, addressing adaptations, modifying exercises (easier/peelback or more difficult/progression). Exercise handouts give patients take-home info to practice what they've learned. Mark your expectation of repetitions, and "recheck date" to ensure compliance. Bonus: a copy of Stand Taller ~ Live Longer. 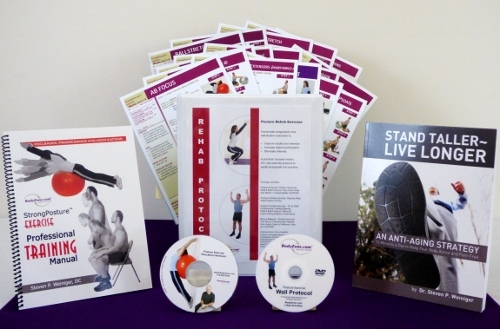 Packed with patient education, posture assessment, posture anatomy and posture principles. We recommend you enroll in the first 3hr class of Posture Practice (online) when purchasing the Posture Rehab Protocol. Due to the reproducible nature of electronic and printed media, this item may not be returned or refunded for any reason. I've used the rehab system since taking a course by Dr Weiniger about 4 yrs ago. It gives us a systematized plan to rehab patients in a way that can be lead or supported by staff and tracked. Giving patients a takeaway has set the expectation of compliance, which was previously a problem. If you use the entire set in the way they direct the results are remarkable. What I like best it the rehab is taught and applied in a very systematic order. Order arrived within a few days. Our patients love the Strong Posture Program in our office and we have it included in 80% of our patient care plans. Thanks for such a solid program. Open communication is what makes our practice a great place to be. It is a great place for the StrongPosture® program. Posture is not just valuable – it's indispensable. Balance is indispensable, core strength is indispensable – and the ball work is an adventure. My clients are very motivated by improvement. We start with small goals and work toward them, and as these are met, we move forward with bigger challenges. I've been employing the grid – it helps me as I assess the exercises for wall tilts and alignment exercises (Strong Posture protocols). You see people gradually inch closer to the wall as a result of their work. It's nice to see the improvement, but also to let them know that they are making progress and that you are paying attention to that progress. It makes a difference in their determination and compliance. I believe in empowering those I work with to become active participants in their wellness, and Dr. Weiniger's programs teach this as a priority. BodyZone's educational presentations and patient handouts have been an excellent resource to reach this goal. Many of my patients have been impressed and comment that the information was so helpful for their recovery. I have realized the endless benefits of strong posture for people in their daily lives, not just to treat problems but avoid them all together. I have started a wellness education company to make this knowledge readily available to everyone. Posture training will be the cornerstone of the services we provide and will ensure my clients achieve lifelong benefits. A balanced body leads to a balanced life and BodyZone has trained me to be an expert! Dr. Weiginer is a wonderful instructor who not only is highly knowledgeable but passionate about his craft. I think every chiropractor should use and offer Stand Taller ~ Live Longer in their offices to their patients. This book contains extremely valuable information that every patient should read, followed by practicing the exercises listed. Also, attending a class by Dr. Weiniger is a must. Stand Taller ~ Live Longer is a great book for professionals seeking an educational tool. The book can be given to patients to read, or with a prescription to review pages targeting exercises and concepts relevant to their specific problem. In addition, Dr. Weiniger's book can not only help educate your patients, but is also a tool to recruit your patient's families and friends into a lifestyle of active care, posture awareness and wellness. Click the button below to add the Posture Exercise Rehab Protocol Set to your wish list.